Posted On March 25, 2015 by Team iCynosure. With the temperatures rising in Mumbai, a product has come as a wonderful surprise and a true gift to counter the blistering heat. So what is this product I’m talking about? It’s Kulcar Version 2, a Solar Powered Car Cooler. You may wonder what this product is all about... Is it another air conditioning unit or a device that cools the car when needed causing battery drainage and / or huge expenses? No it isn’t. Kulcar Version 2 is a car cooler that is powered by the sun via a solar panel fitted on your car window frame to control the temperature inside your car. Twin turbo fans connected to the solar panel help in controlling the temperature inside the car by replacing the same with fresh air throughout with the help of the car cooler. In Mumbai, cars parked outside in the sun turn into heat machines. One cannot expect the car to remain cool or even bearable after a few hours in the sun. The temperature within the car rises a great deal and at a point the inside of the car is hotter, more humid and completely unbearable. In such cases all you want is a more manageable environment to travel. That exactly what Kulcar Version 2, Car Cooler does. Sounds really cool isn’t it? It sure is that cool. We at iCynosure did test this and are amazed at the results. When we received the product we took time to unbox it and understand the different parts of the product. The product has one main component which is the solar panel attached to the turbo fans. Other parts include a plastic strip cover that you can use in case there are chances of rainfall in your city so as to make sure the rain water doesn’t enter your car. One other important part is the solar stopper that must be used when you don’t wish to use the product to obstruct the solar panel. It is used to cover part of the panel ensuring that the solar generator stops for the time. Once we understood how Kulcar Version 2 works we were quite eager to try it and we installed it on our car immediately. The installation is very simple, you really don’t need to do much except measure up the length of the car window frame and cut the rubber panel accordingly to ensure the product fits well on the window. We let our car as is for a few hours, parked in our building open park with temperatures fluctuating between 35-38 degrees celsius and humidity almost 55%. When we couldn’t contain our excitement any longer we went straight up to see how the product had made a difference to the environment within the car and whether or not it made sense for us to continue using it in a city like Mumbai. As we went to check the effects of the car cooler after about three hours we were absolutely amazed with the results. The temperature inside was definitely much cooler as compared to the outside of the car, the leather seats and the metal parts of the car were cooler and not hot to touch and above all there was no bottle-up of heat that hits you when you first open the car after a considerable time in the sun. 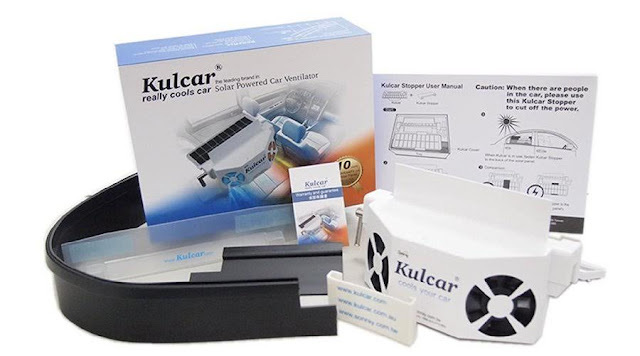 With the summers in Mumbai at their terrible best, primarily the travel in the car is not pleasant but with a product like the Kulcar Version 2 Solar Powered Car Cooler it helps maintain a stable and cooler environment within the car which makes the journey worthwhile. Overall I think it is a brilliant product and I’m happy to have had the chance to experience this product. The company Sonray has put its mind and energies behind developing this amazing product that is going to benefit users all around the world. If you have any questions, please leave them in the comments below and I’ll try to get them answered for you.